This series has been an interesting one for me. In the first two books I really couldn't stand Ten's character and her constant indecision but I kept holding out hope she would grow. I was granted my wish in EVERLIFE as she's to the other extreme and aside from a choice that has far reaching consequences at the start, she never once wavers in her devotion to Troika. It actually made me admire her a great deal. She finally made her real choice, and no matter how insurmountable the odds nor what was brutally done to her, she never budged. It was, refreshing to be honest. However, this came at a cost as Killian turned into the opposite and while I won't go into details to avoid spoilers, the events surrounding his changes more than frustrated me. It felt more like a plot ploy rather than a well executed twist which is a shame as it lessened the romance for me. Romance woes aside, I actually enjoyed this whirlwind ending to the trilogy a great deal. The first two books showed potential, but were ultimately rocky. But this series ender definitely took things out on a bang. The world is truly fascinating and the light vs dark aspects old enriched the series more. EVERLIFE truly showed that everything isn't always as it seems and things are not black and white. Light isn't always good, and darkness isn't always evil. There's shades of grey and good and evil on both sides. And that the path to peace is finding balance not truly good/evil or right/wrong. I really enjoyed the way everything was built up, and that ending! Oh, my did I not see that coming! All I can say is very well done Ms. Showalter! 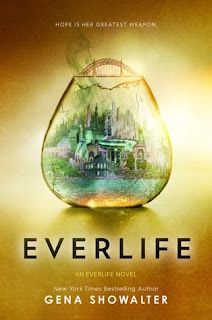 All in all EVERLIFE was a very satisfying conclusion to the trilogy. You won't be disappointed.